PhoulBallz.com: Get Author Allen Schatz's Baseball Mystery "Game 7: Dead Ball"
Get Author Allen Schatz's Baseball Mystery "Game 7: Dead Ball"
Local author, and massive baseball fan, Allen Schatz's initial literary release "Game 7: Dead Ball", a murder mystery based around the World Series in Philadelphia, is now in print, after a successful run as an electronic-read only release. 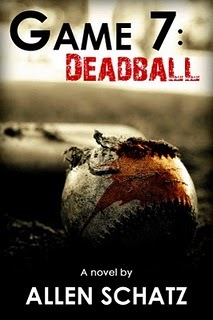 Washington, Pennsylvania - Allen Schatz, Philadelphia native and current resident of western Pennsylvania, mixes a love of the game to spin a mystery-suspense yarn where revenge hides at the core. The book, titled GAME 7: DEAD BALL, targeting mystery fans and baseball fans alike, takes place before and during the 2008 World Series. The lead character, umpire Marshall Connors, believes a vacation cut short is a reasonable price to pay for the opportunity to work the games, but that price rapidly increases when he finds himself in the middle of something more intense than the games on the field. Schatz, who happens to be a friend of PhoulBallz.com, invites all readers of this site to take advantage of a special offer. Buy the book early, before its official hard release date of July 1st, and get 10% off. Allen may also deliver personal high fives to certain fans. Click THIS LINK to get the book and enter code SG4Z85JL to get your exclusive PhoulBallz.com discount hook up. With two sequels on the way, Schatz's work is definitely a triple play that baseball fans shouldn't miss.